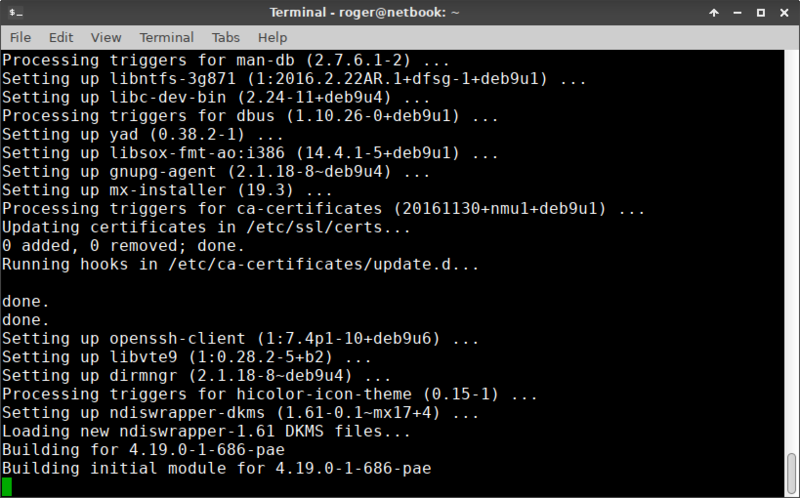 Several weeks ago, I upgraded my 10-year-old Asus eeePC from Xubuntu 16.04 to 18.04. The previous LTS was coming to an end, and so I let the system bump itself to the latest release. 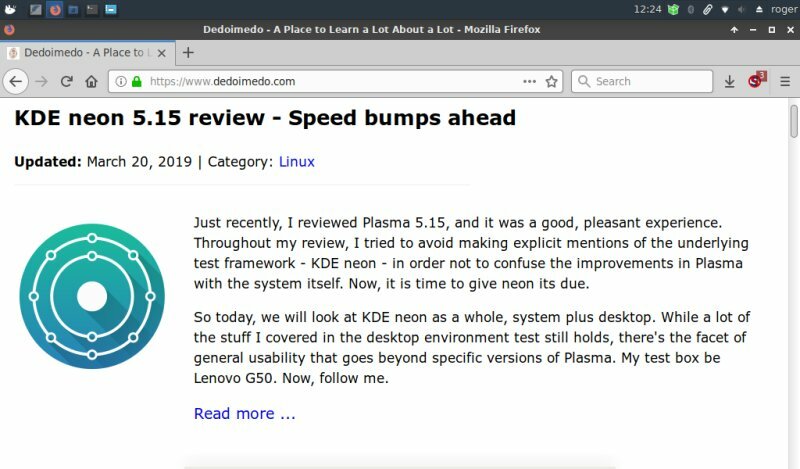 I then tested the behavior of the old netbook, and the results weren't good - either with the Xfce or the Plasma desktop I installed thereupon. It seemed like an end. But then you emailed me. I've never received so many emails on any topic - and I have to thank you all for your suggestions. Some of you recommended hardware tweaks - more memory and SSD, but I felt investing in a decade-aged platform would not be wise. 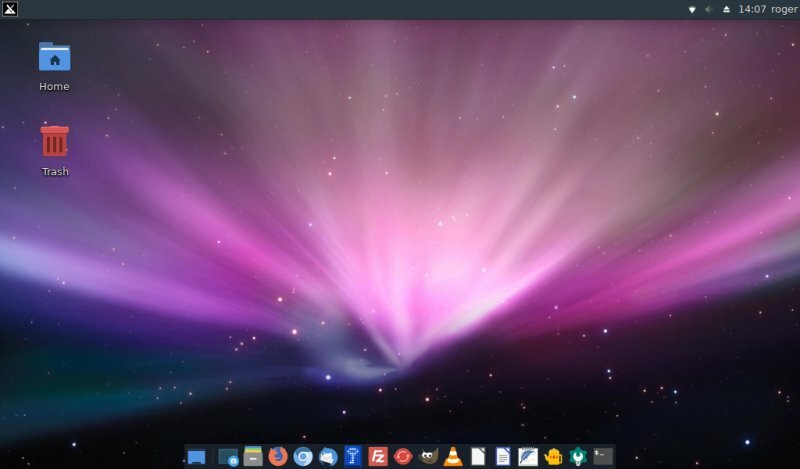 Most of you said - try a different frugal, lightweight distro. Your chief candidate was MX Linux, which has shown some great promise in the past two years. So I thought, well I ain't got nothing to lose. Indeed, when you have no choice, it can be quite easy sometimes. You do things you wouldn't normally contemplate, like perhaps marrying your cousin or introducing a brand new Linux distro in your production arsenal. I tried the latter. As you know, I've praised MX Linux far and wide. It was my top Xfce distro of 2018, and it ranked equally high in my annual tally, too. It only makes sense that I try that as the first option. Anyway, I went to the official website and grabbed the 32-bit ISO (not too many distros offer this anymore, mind). Etched the image and fired up the netbook. No go. Well, even though my EeePC was configured to boot from a removable device first, I had to explicitly select the external media. So a moment of micro-panic, and all is well. Booting. 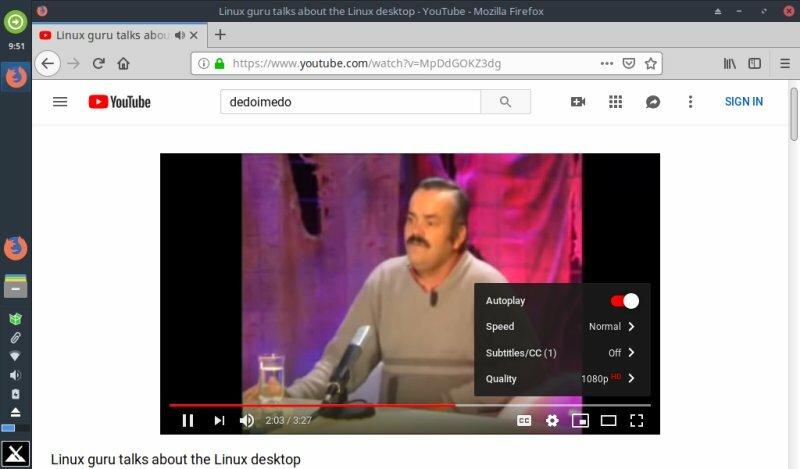 The first thing I did was actually fire up Firefox, go to Youtube and try watching a clip. After all, this didn't work well in my previous tests, so I wanted to check whether I'd have anything close to a reasonable experience. If not, then perhaps there would be no pointing continuing. As it turns out, this worked very well. I tested one of my own clips. True, originally it's a 320p video upscaled to 1080p, but even on HD, it was playing pretty well, and there was no tearing or stutter. Good FPS. Blimey. It felt like going back 3-4 years in time, for when the eeePC still purred mightily. And that pretty much decided it for me. There was gonna be an install. While playing the clip, the utilization was high, but not mega-high. I had to be careful with the installation - 10 years worth of real data there. But I had wisely split home and root back then. The MX Linux wizard behaved well. It asked me if I wanted to preserve /home data, and confirmed both the format and non-format options. Then, it took only about 15 minutes to complete. When I set the user, because I had used the same name as the one that already existed on the disk, the wizard asked whether this was what I actually indeed, and whether to re-use the contents. Things went well. I logged into a system that looked very familiar to my Xfce setup. On the good side, all the data was intact, and my settings had all been preserved. During the installation, I chose NOT to save any live session stuff, because I wasn't sure if there would be a conflict between the live data and my existing /home data. This is indeed an open question for the MX Linux team. 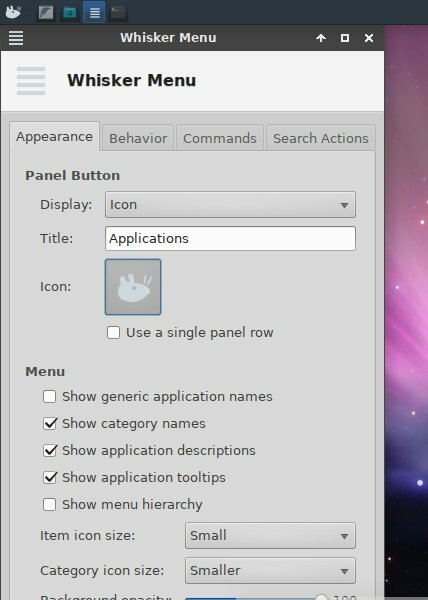 On the bad side, the existing Xfce configuration was clashing with MX Linux 18.1. 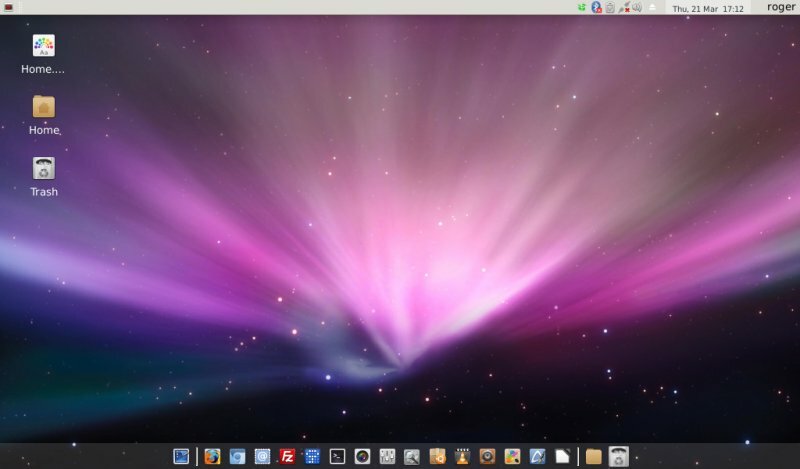 It didn't have some of the Xubuntu themes, so the icons looked weird, and the fonts were all fuzzy. At this point, rather than troubleshoot a dozen papercuts and oddities resulting from 10 years of non-stop usage and some five in-vivo upgrades, I moved the ~/.config/xfce4 directory aside and started fresh - a brand new session. On the top panel, I removed the workspace switcher, reduced the height to 24 px, changed the window list to show icons only. With the second (default) panel at the bottom, I set it to auto-hide and 40% auto-expand width, populated it with shortcuts, and removed two or three widgets, leaving only the Show desktop icon, which is super handy. I tried using the Faenza icons - which look really square and neat above - but somehow, they didn't integrate as well as on Xubuntu, especially the system area in the top panel, so I used Papirus (ePapirus), although the Adapta Nokto set is also okay, however the button icons and anchors are too pale with that. I kept the Sans fonts, but did tweak AA settings - Medium/RGB hinting. I also configured Whisker menu as the default app launcher. 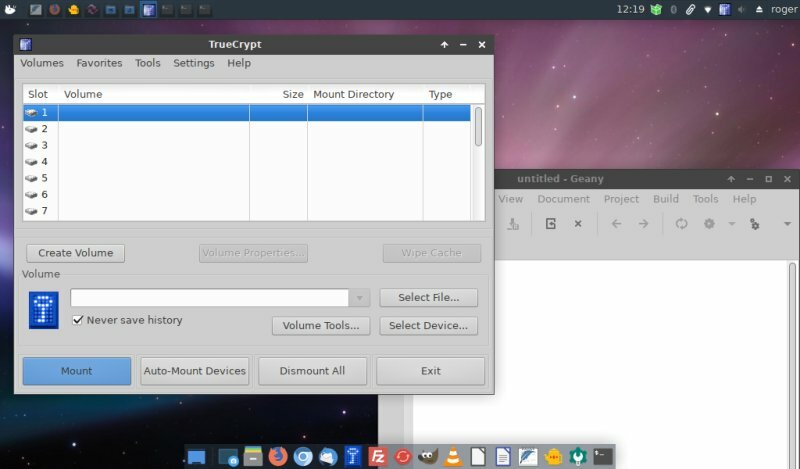 Lastly, I reinstalled a bunch of software that was missing but that I had in the Xubuntu set, including Grsync, Abiword, Filezilla, Chromium, and TrueCrypt. All my settings were correctly preserved, and the programs behave as though nothing had happened. There were a few small annoyances. 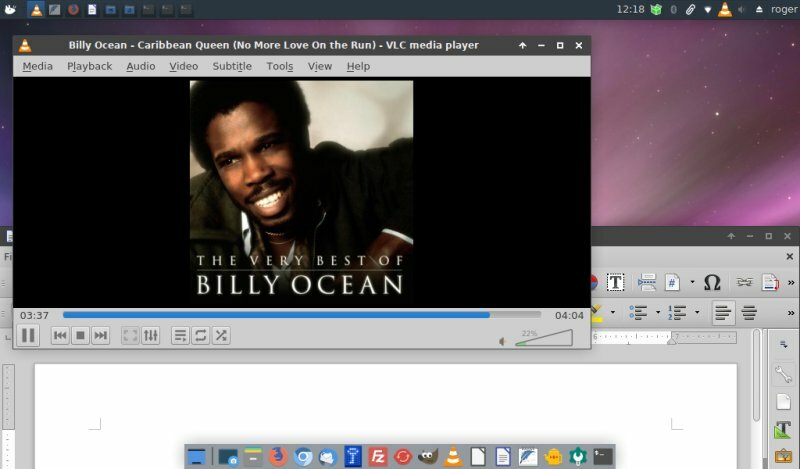 I'm not keen on the variable-size system tray icons the likes of VLC for instance. The whole thing feels busy. Some app menus are too "tall" for the screen, so you need to right-click and move them to be able to access important buttons and options, which are usually located at the bottom. You can't really move these windows up and down unless you know the right-click trick. Whisker used a lot of CPU when I tried to edit its icon. For some reason, it took 2 minutes to open the icon list, and then another 30-40 seconds before I could locate the MX logo. 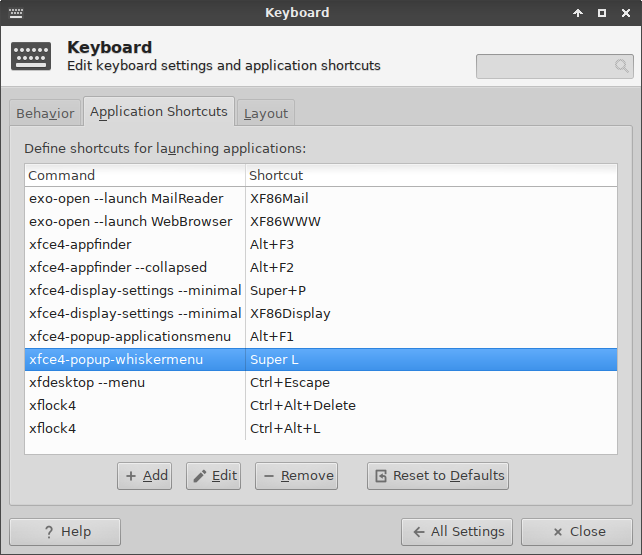 I also had to add a keyboard shortcut to launch the menu with the Super key. The hidden panel is ever so slightly visible. Grrr. The update manager worked well. Fast and reliable. I did notice one problem, though. For some reason, the AntiX ISO repo was also included in the sources list, but it wasn't signed. Once I disabled it, the system did its share of updates just fine. But this is something that feels like a leftover from the live session or such. W: The repository 'http://iso.mxrepo.com/antix/stretch stretch InRelease' is not signed. But all this is fluff. What really matters is how the netbook behaves. And it behaves oh so well. It's fast and responsive. LibreOffice, which wouldn't even start previously, opens within about 10 seconds. Firefox takes about 20 seconds to launch, but then it runs fine. 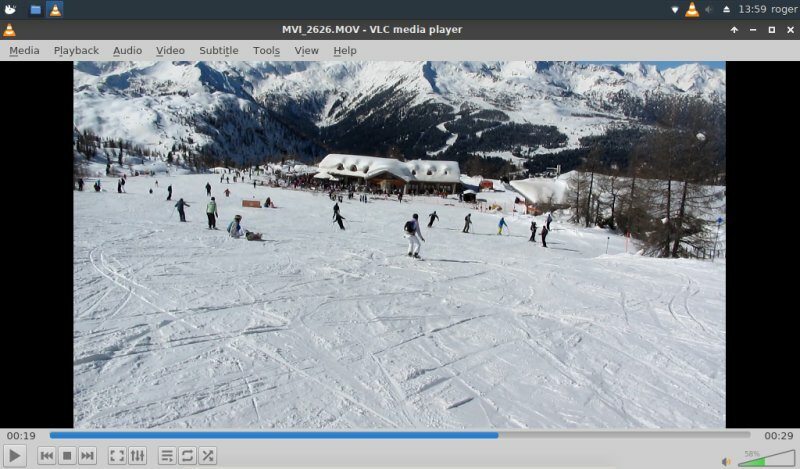 I tried 720p video, and the playback is quite all right. I even tried 1080p, and that's where trouble starts, but then, this device has never been rated for anything above 720p, so this is already a huge achievement. You can multitask reasonably well. 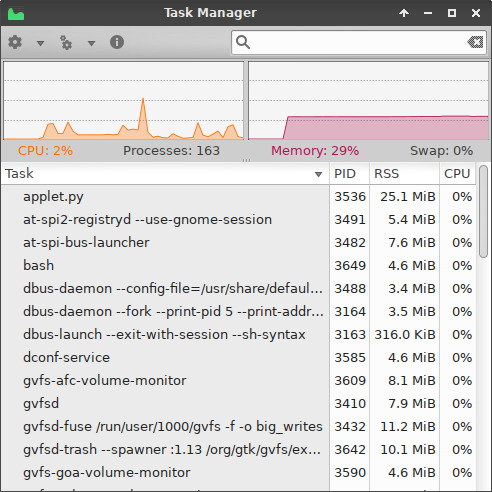 It does take a little to load app data into memory from the disk, but I had music and updates running in parallel, plus some light browsing, plus two or three other terminal windows, a text editor, and a bit more. Very, very cool. Notice the lovely list of apps in the top panel. This is amazing. On the idle, the system is quiet. Using only about 2-3% on idle. Sure, it did jump to 20-30% even on small operations, but remember, this is a 10-year-old machine that until three weeks ago was destined for scrap. Now it's chirping melodies and videos, I'm using the latest software just fine. Only 280-290 MB memory footprint. 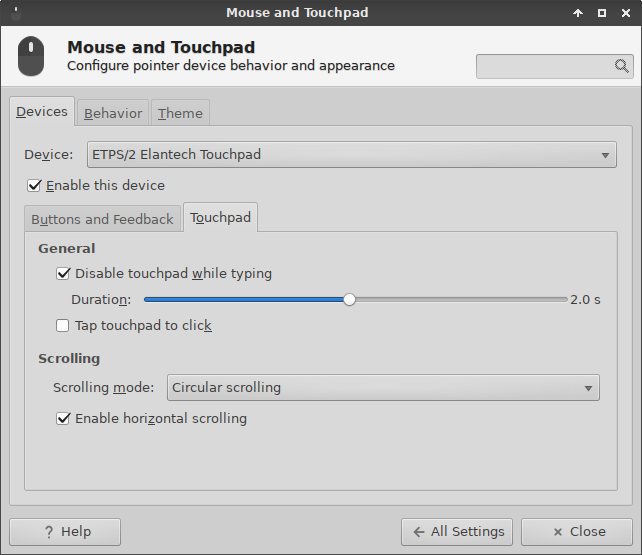 I did have two problems - some of the Fn buttons were not working - oddly, similar to what I encountered on a completely different machine, and with a different distro, specifically my Vivobook and its upgrade. Moreover, the fan control was not working, either. Notice, these are not new issues. They have existed ever since I got this machine, and it angers me that hardware problems are left lingering about. Again, this is not at all different from the Nvidia & suspend issue on my LG RD510 machine. Coincidentally, this is another decade-old system that needs upgrading. 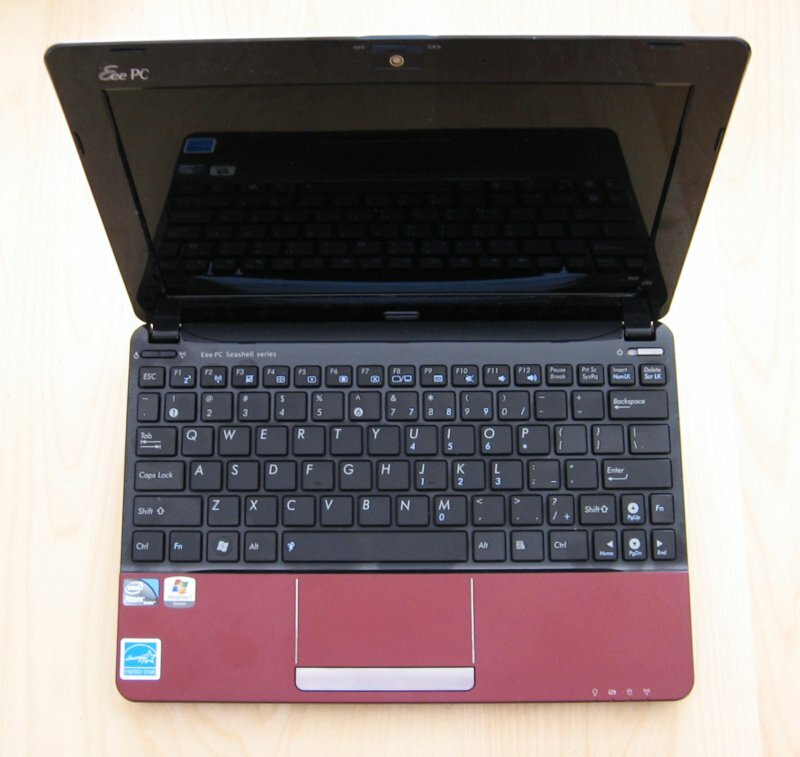 We will talk about sorting out EeePC hardware kinks in a separate article very soon. And for that reason, we'll talk battery life separately, as well. Apart from that, it was mostly very good. Webcam worked fine. Suspend & resume, check. Touchpad was a bit jittery, but I quickly sorted that out. I was able to connect my smartphones, and they were all properly identified and mounted. 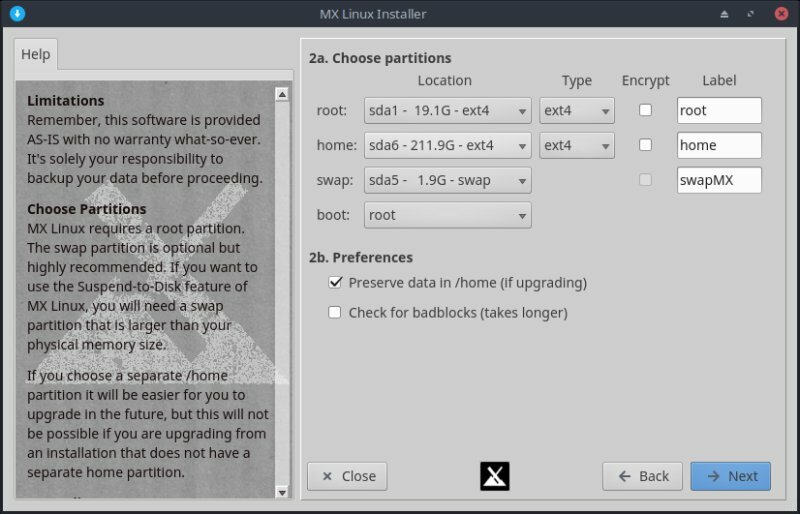 As I continued using the little thing, I kept getting more and more impressed by MX Linux. Crisp fonts. Solid performance. Continuum was robust and without errors. Once I've sorted the hardware niggles, it really did everything splendidly. 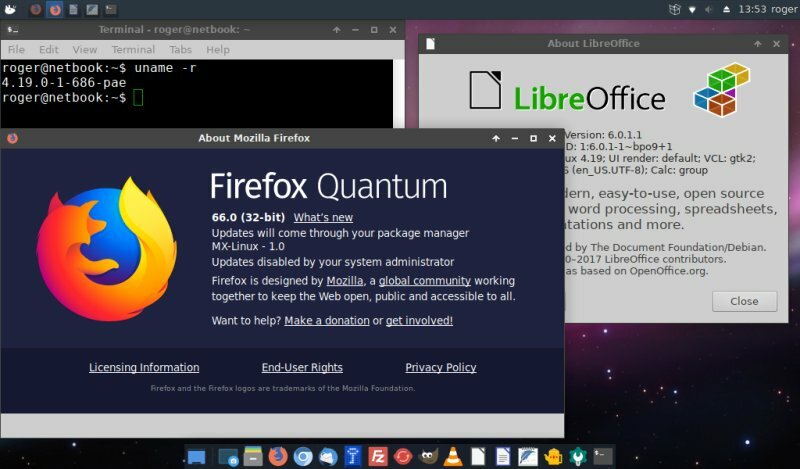 Samba sharing was working out of the box, I had kernel 4.19, LibreOffice 6.0, Firefox 66.0. And the same kind of nice, balanced experience this machine had half way through its life. You planned this all along, you drama queen! No, I haven't. Honest, miss. I haven't. I really had no intention of doing this. I am also very leery of making systemic changes to my production setup, or anything that I use even remotely in a semi-serious capacity. My Vivobook and the Slimbook are the only Linux-proper devices that I run. This EeePC netbook also worked in that function until the upgrade - and now it's back in action. This would also signify the first change in my production setup since 2010 or so. 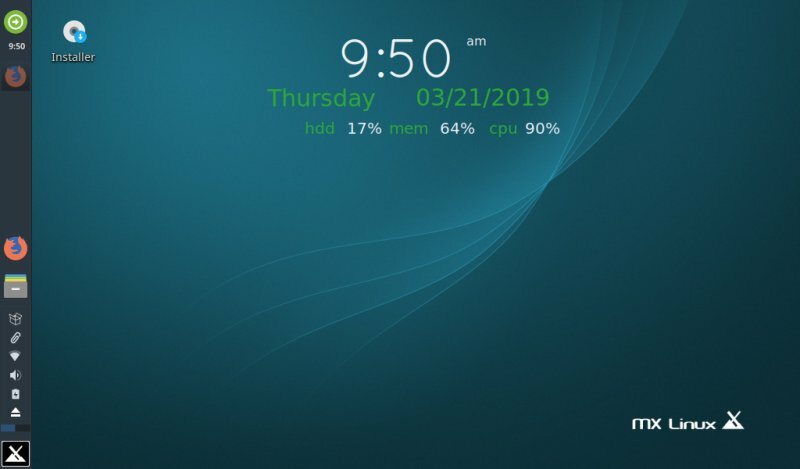 Until that I point, I was using SUSE Linux as my production Linux, Ubuntu (and flavors) since, and now, for the first time ever, there's a completely different distro in the arsenal, one that happens to be Debian-based and pure community. This is a monumental change by all measures of success.